does this firmware update help with any of the shareport issues that currently exist? As far as I am aware, it doesn’t fix any, but the SharePort software might. i’ve already been using the 3.0 software since it’s release. doesn’t work any better. same “drops after a little while” problems as before. It’s a shame it’s not working any better for you, they still seem to be having trouble fixing those connection drops, it seems to be the universal problem with SharePort. is it working for you? anyone? I downgraded mine to the earliest firmware version that supports SharePort, but I don’t use it, I figured it’s much better having a router that doesn’t drop connections in general and has good wireless stability. Finally, after upgrading to the 1.3* i had to go through hell, speed drops and reseting the router every week sometimes more frequently the 1.34 has solved all of my problems. Has been up serveral weeks without disconnects or slowdown. 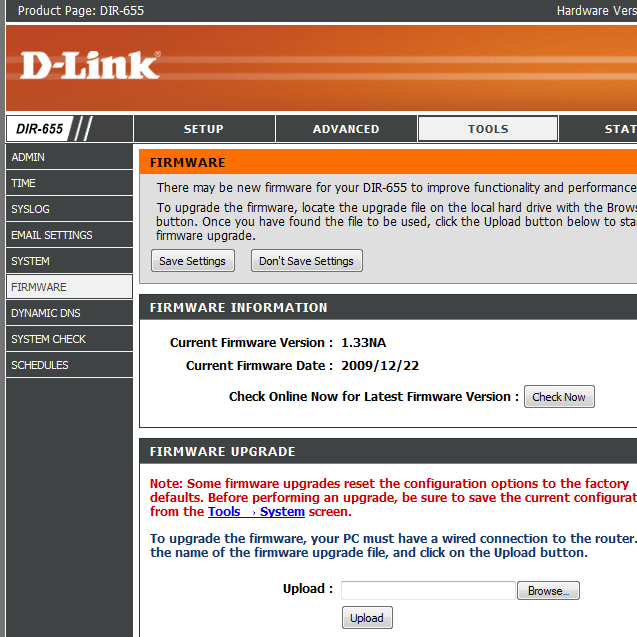 I have a major problem trying to Configure my New D-link DIR-655 Router for my MacBook. Mac OS X 10.6.8. Can anyone please guide or refer me to someone….oer a forum where I can fix this. I just bought the DIR-632 for my mac os 6.8. and the sharepoint that came with the box didn’t work but the link from this page did! Thanks! I also upgraded my firmware to 1.03NA just so everyone who’s having problems knows.